Genesis had me from the description! I mean hello “ Mad Max meets X-Men: First Class” yes please. I was ecstatic that once I started reading Genesis I could not put it down I had to know what was going to happen next. I was done with it in a mater of hours…yep I had that much fun with it! I think this is my first dystopian-like book I’ve read were the characters have a type of super power. I really liked the way Hartness introduced the powers and how he had them manifest in people. I thought it was a great take on the new world the characters were living in. "…you know in disaster movies how there’s always the one guy who sees what’s coming before anyone else and tried to tell everybody about it, but nobody listens and then they’re all screwed? … Well, in this movie, I’m that guy…"
Matt tells his motives behind preparing for different apocalyptic circumstances, but I would have liked more. He just seemed so driven and for me the reasons did not compare. But, we may find out more in future books. Christin is Matt’s older sister and my favorite character. I felt so much of the book through her. Christin is sweet, vulnerable, strong, and she can zap someone clear across a room if they get out of line. I want to say more about other characters but I’ll start spoiling things. I thoroughly enjoyed Genesis. It is fast paced and entertaining, sweet, and heart breaking. 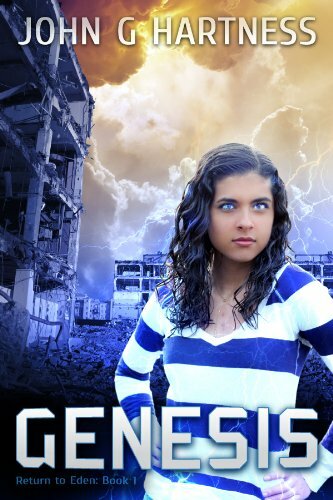 Genesis is a book of survival, hope, love, and understanding. Teen and up: For Violence, language, light kissing. Great review! I read the excerpt that came out yesterday, and I thought the style was good, the pace great, and the whole idea interesting. Now, though? If you tell me that characters are the strong suit, which makes them even better than the above points, and you add in the super powers I had no idea about... Well, I must read this one! My latest posts: On My Wishlist,Review: A Monsster Calls and a Giveaway! @Ron and @Jac I really think you both would eat this one up! It's so good! Oooh, sounds promising! I'm always interested when characters are the strong part of a story; they're usually the element that can make or break a book for me. Love post-apocalypse stories so will check this out for sure.